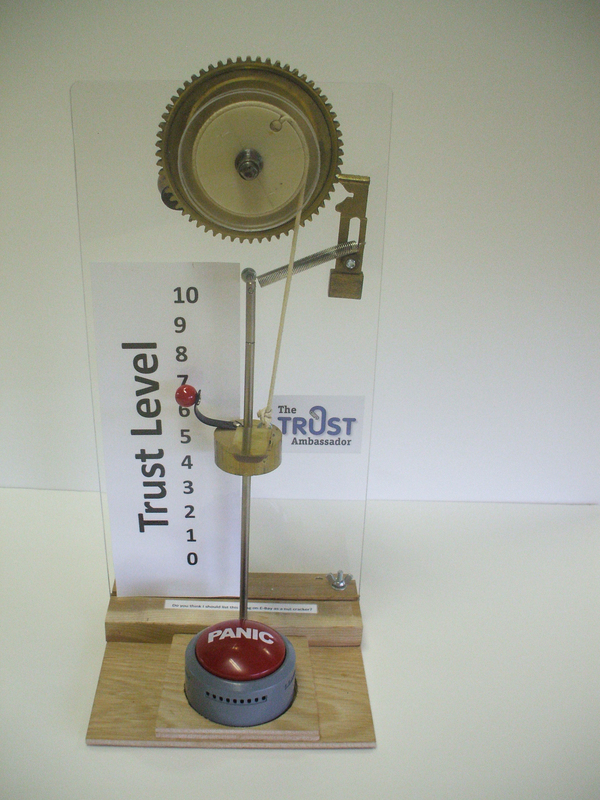 A few years ago, I built a kind of Rube Goldberg invention that I call my “Trust Barometer.” It has a ratchet with a handle and a crank so that I can wind up a weight suspended by a string and I have a scale showing how much trust is in a relationship. Trust is similar to a bank account we have with people. There is a balance of trust at any point in time, and we can make deposits that increase the balance, or we can make withdrawals that reduce the balance. Of course, the idea is to keep the balance as high as possible, and then we will enjoy the benefits of high trust with that person. The barometer works well to illustrate an important principle. Trust is usually gained in small steps like the individual clicks of a ratchet, so over time we build up trust with another person by making small deposits and winding up the weight. We do things like treating people with respect, following up on promises, helping out when there is an opportunity, and hundreds of other small things that all add to the trust account. Making large deposits in the trust account with people is more difficult than making small ones. It usually takes a special situation to make a big deposit. For example, if I am walking by your house and you come running out screaming that your house is on fire but your dog is trapped, that represents a unique opportunity. If I go in and save your dog, that would be a large trust deposit because I risked my life to save your dog. It was a special circumstance in which I had the opportunity to demonstrate my bravery and affection. Normally we make deposits in small steps, but the account builds up over time. The trust scale has a numbers from 1 to 10. The ratchet is held in place with a pawl that prevents it from rotating backwards. When there is a trust withdrawal, the pawl disengages and the weight crashes down to zero setting off a button that enables a screaming voice, as if all trust was lost in one statement. It is all very comical, but it is a great illustration of how trust is built and lost in our lives. In English, the ratchet effect sounds like this. I have known Mark for several years. I’ve always trusted him; he has never given me any reason to doubt him. But after he said that in the meeting yesterday, I’ll never trust him again. We think that way as individuals, and it really works against trust because it takes so long to build up the account of trust and it can be destroyed in a single sentence or even some body language in a meeting. The trouble is that when we go to rebuild trust, it takes a long time before the deposits even register in higher trust. The best way to show the dynamic is to view this six-minute video of the trust barometer in action. Exercise for you: Today, simply be aware of the transactional nature of trust such that you have a balance in the trust account with people and every time you interact with them you’re either making deposits in the trust account or withdrawals. Notice how when there is a withdrawal it can be a very serious withdrawal very quickly. That is the phenomenon demonstrated by the ratchet effect. Leaders need to recognize that it takes a long time of consistent deposits in the trust account to build up an impressive trust balance, but that balance can be wiped out in a single sentence or gesture or email or any other interaction with the other person. In order to maintain a good balance of trust we need to be consistent with deposits and avoid the mega trust withdrawals. This entry was posted on Saturday, October 24th, 2015 at 7:29 am and is filed under Candor creates trust, Communications, Enabling Actions, leadership, Trust, Trust and breach of trust, Trust and fear, Trust and motivation, Trust and respect. You can follow any responses to this entry through the RSS 2.0 feed. You can leave a response, or trackback from your own site.